We did it! Byte Night has raised a million big ones - £1m. Let me put that into context for you - if we were to place every pound coin we have raised this year in a line, it would reach from Trafalgar Square, to somewhere in Essex, let’s say Billericay. Probably. (I’ve done very little research). This is all thanks to the incredible hard work and generosity of the IT industry. On Friday 4 October 1,150 people from the IT and business community across the UK slept out for Byte Night, to raise money for Action for Children. This year was bigger than ever with events taking place in Belfast, Birmingham, Cambridge Edinburgh, London, Manchester and Reading. 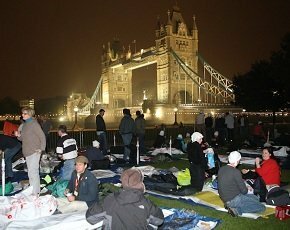 Byte Night is now a truly national sleep-out and one of the UK’s largest and best supported fundraising events. I never imagined 16 years ago when we started that it would grow to become such a significant fundraiser, raising more than £7m since 1998. The incredible support that we receive from you is what keeps us growing year-on-year, each time raising more and more money to help vulnerable young people across the country. By supporting Byte Night you have helped Action for Children to tackle the root causes of youth homelessness. Action for Children works with young people, such as those leaving the care system, or at risk of family breakdown, or those who are already without a safe place to sleep. Last year over 100,000 young people slept rough in the UK. The money you raised will help Action for Children projects across the UK to support vulnerable young people at risk of homelessness. It will provide them with the space and security they need to work out what they want from their lives and help them to get their dreams back on track. But most importantly I would like to thank everyone who gave up their bed for the night and braved the cold to help make Byte Night one of the UK’s largest fundraising events. In doing so, you have made the UK a safer place for thousands of vulnerable young people. Ken Deeks is the founder of Byte Night. Since its inception in 1998, Byte Night has raised more than £7m towards Action for Children’s work providing vital help and support to vulnerable young people across the UK. Advice, budgeting skills and counselling, education and training programmes and vital accommodation are given to hundreds of young people at risk of homelessness every year.